Fifteen years ago, when we moved to Chez Snail we had almost no furniture, having managed with very old items that I inherited from my nan. They had served us well in our little cottage, but the new house was bigger and some of the old stuff was completely beyond repair. We had some things that were good – our bed, a dresser, a coat cupboard and gate-legged table, plus lots of bookshelves. But furnishing a whole house is expensive and so we hired a van and made a trip to Ikea, where we bought pretty much everything we needed. And I’m pleased to report that almost all of it is still going strong. As I’ve mentioned before, I’m currently re-covering the sofa in crochet, but the actual piece of furniture certainly doesn’t need replacing. 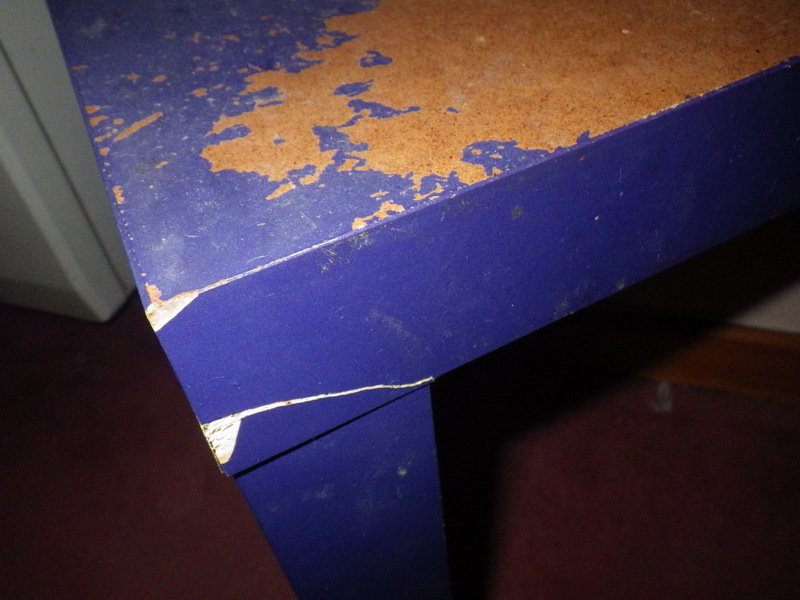 The only things that have finally started to break apart are the triangular side tables that we bought for £5 each. Over the years the surfaces have got damaged, but now structural cracks are starting to appear and the end is in sight. And so, with my recycle and re-use hat on, I sought replacements, although the old ones will still get some use in the limery I think. I thought about buying a second-hand nest of tables, but I really wanted something a bit more modern… and so to Etsy I went…. Where I discovered JB Wood Designs, a company making furniture out of, amongst other things, reclaimed apple crates… and I couldn’t resist. So, we are now the proud owners of not only two new side tables, each with a built-in shelf, but also a coffee table/storage unit on castors that will be so useful. So, no more mass-produced furniture for us – I’m loving being able to support a small manufacturer, plus I now have more space to store yarn!! Anyone who has been following this blog for a while will know about my search for a green bath puff and the various trials I have conducted with patterns and yarns. It’s not been easy and I have finally had to accept that it is impossible, using natural materials, to recreate the qualities of nylon exhibited by the standard bath puffs you can buy in supermarkets and chemists (drug stores) for a few pounds (dollars). For example, none of the fibres I have tested produce the amount of lather that you get from a nylon puff* and all of them are much more absorbent, being more like a spherical flannel (wash cloth) in some cases. However, if you wish to tread more lightly on the planet, sometimes you have to adapt… and I now have a range of bath puffs that have different characteristics and suit different people. All of the puffs I have made use recycled, upcycled, waste or organically produced fibres and are I make them by hand, so certainly have less impact on the earth than the commercial nylon versions. They are all crocheted by me… a skill I have learned specifically because of this project, but which I’m now using to make all sorts of other things. So, what sort of puffs have I made? The following is a list of fibres used, their source and characteristics. Acrylic: all the acrylic yarn that I use is either reclaimed from previous projects (e.g. unravelled jumpers) or is left over from completed or abandoned projects (usually not mine!). Acrylic bath puffs are the least absorbent of any that I make, although they still hold a lot more water than a nylon puff and so take longer to dry. They have a slight abrasiveness that increases with use. They produce some lather, but this depends on the soap/shower gel you use and how hard or soft your water is. This is the sort of puff I take with me when I am travelling. Organic cotton: So far, this has had to be purchased new, and is relatively expensive. However, it does make up into a lovely soft and gentle puff – ideal for delicate skin. You don’t get much lather and it is very absorbent so takes quite a long time to dry: you need to think of this version as a type of wash cloth. I have used two different yarns for these puffs so far: Debbie Bliss Ecoaran (in shocking pink) and Twilley’s Sincere Organic Cotton (in a pinky-beige). Recycled cotton and acrylic: This yarn (Sirdar’s Simply Recycled Cotton- Rich), made of 51% recycled cotton and 49% acrylic, combines qualities of the two yarns described above: the softness of cotton and the reduced absorbency of acrylic. I like the principle of using a recycled fibre (from t-shirt manufacturing), but sadly the acrylic doesn’t seem to be recycled. I’ve made these in a terracotta colour and in green (how appropriate!). Upcycled wool: Whilst not to everyone’s taste, this is the fibre I prefer my bath puff to be made of. The sort of wool has an effect on how abrasive these puffs are, but all wool tends to be a little bit ‘scratchy’. I use wool collected from unravelled jumpers or left-overs, so it’s rare that I know the brand or type of wool. They tend to shed some fine fibres to begin with, but this soon stops. After a couple of months of use, the wool starts to felt, but this makes them even nicer to use. 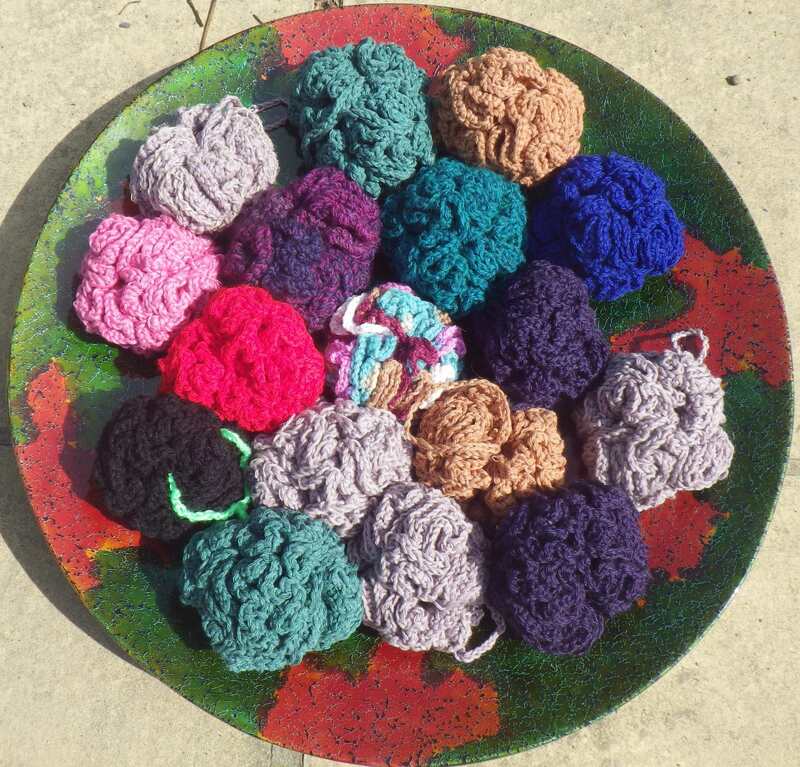 I’ve made these in green and purple so far… my bath puff here at home is a purple one made from wool from an old cardigan. A bowl of bath puffs! So, if you’d like one, contact me (thesnailofhappiness@talktalk.net) – for UK customers, they are £10 each including delivery, if you’re further afield, I’ll have to check the postage. * Although using GreenPeople shower gel helps a lot!